Does your Toyota Avalon have burned out headlight? Are the taillights not working? Not a big problem. They are pretty simple to change. Here is how to replace your headlight and taillights. 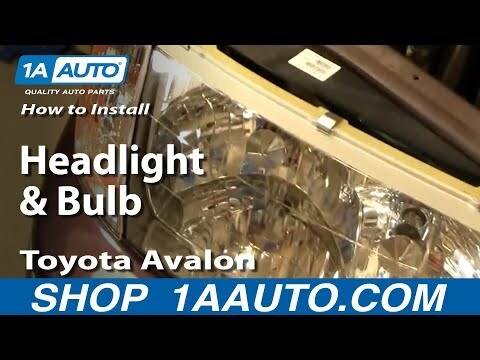 Are your Toyota Avalon headlights not working as well as they should? It is time to change them, here’s how. Before you begin working on your Toyota Avalon make sure you park the car in a well lit location and you have ample time to complete the job. Rushing through a job or having a dim work area can lead to mistakes. Also, remember that you should wear gloves when working with headlights. The oil in your skin can cause them to not last as long. First, locate the headlight housing by opening the hood. Look for any bracing that prevents you from removing the lights. Remove these braces. Next, find and trace wires that come from the headlight housing. There is normally a tab that keeps them connected, find this tab and disconnect the lights. The wires connect to the bulb. Find the plastic housing and twist to remove the bulb. Now that you have replaced the bulb, it is always a good idea to check your alignment as well.